I was up really late last night piecing Blake's Quilt. By the time I went to bed the quilting was nearly finished. I have come home to the heart breaking news that beautiful little Blake has gained his Angel Wings. No words that can be written can begin to express what I feel for his Parents, family and all of you for helping me make Blake's Quilt possible. Hold your loved ones just that little tighter. I do not know Blake or his family. Their story touched my heart. still coming will be made into another quilt and donated in memory of beautiful little Blake. Oh Sharon,it brakes my heart,that sweet baby boy fought so hard.My thoughts are with his family. They are sure to be comforted by the quilt Sharon,filled with international love. You are a beautiful caring compassionate girl,and it's a wonderful thing you have done. I feel so sad for his family. Your quilt looks amazing and I am so glad you will still gift it to his family. I hope they feel the love in the blocks made. I agree completely with everyone's comments. So sad. My heart breaks for his family. your quilt is beautiful and so is your heart. Really sad news Sharon, your quilt for him is so special and I am sure all the quilty hugs that went into it will be felt and appreciated by his family. I'm so heartbroken. His parents, family and well-wishers are in my thoughts. The quilt is an amazing tribute. Such sad news about Blake, my thoughts are with his family. Your quilt is a wonderful project, and I hope it gives his parents some small comfort to know that so many people cared about their little boy. Oh my , such sad news. I feel that we got to know little Blake just a bit through your special quilt. I'm sure his brave family will seek comfort in your quilt gift. I'm sure Blake's parents will love to have the quilt.My beautiful boy will be taking care of Blake and showing him how to use those angel wings. My heart aches for his parents. I am so sorry to hear that Sharon. I'm sure Blake's parents will treasure the special quilt. So so sad. I had been hoping he was making a recovery. I'm sure too that his parents will still lovingly accept this special quilt filled with love. This has a been a truly beautiful gesture on your behalf Sharon,it shows what a lovely person you are. Oh such heartbreaking news! 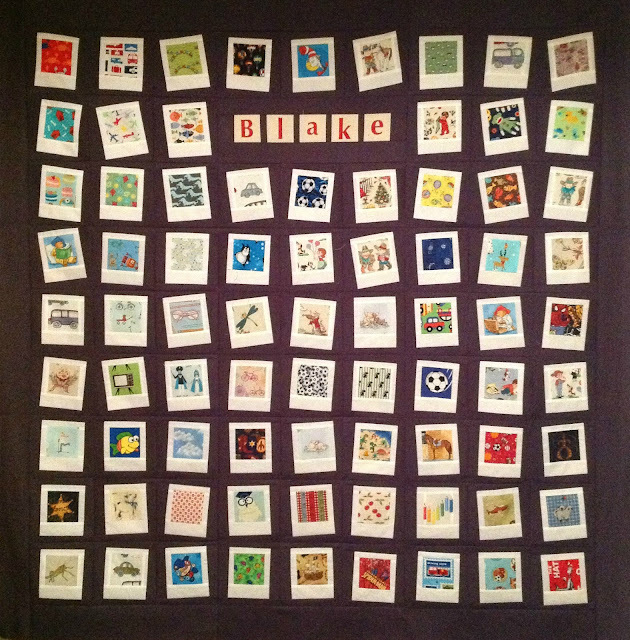 Your quilt is so lovely and it is a wonderful tribute to Blake. Blakes parents will treasure that quilt always, thank you for making it for all of them. Very heartbreaking news. :-( His quilt is wonderful; his parents will enjoy having it. 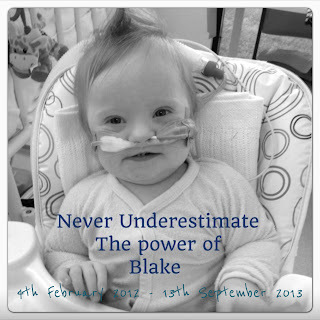 so sad to hear poor Blake lost his battle but is now at peace in the arms of our Lord. The quilt looks wonderful and I am sure it will be treasured by his family. Will be posting 3 blocks to you on monday and hope they will cheer another poorly child. Such sad news. Hoping that this wonderful quilt will bring this little boys' family some comfort. Such a sad loss, but the smile of little Blake has touched so many souls for he truly was a gift for many. My heart goes out to his family. Very sad to hear about Blake, can not begin to understand what his parents are feeling. The quilt you are making is beautiful Sharon, you are doing a beautiful thing. Awwww. A sad tear. My heart breaks for the family and for the loss to this world of a beautiful little soul. I'm sure Blake's family be so moved when they receive this quilt and it will bring them some comfort. Bless you.